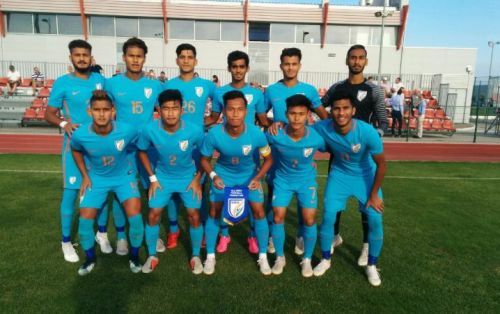 The Indian colts went down fighting 2-0 in the first friendly they played against Serbia. Floyd Pinto's boys have been impressive as a team but in terms of results, it has all gone downhill after the historic 2-1 win over Argentina U20s. The upcoming match against Serbia presents itself as an opportunity to the Indian U19 team to redeem themselves after the setbacks. They had earlier lost all their three matches against France, Croatia, and Slovenia in the Four-nation Tour. The first friendly against Serbia was a huge disappointment as India were the better team on the day and created many more chances. Aniket Jadhav was exceptional as usual as he created many chances and was also presented with many goal scoring opportunities but he failed to provide the finishing touch in the final third. Serbian goalie Aleksa Milojevic also came off with some exquisite saves in the first half to deny the Indians a goal. Bosic Radijove scored for Serbia from the penalty spot after Jitendra Singh allegedly handled the ball in the box in the 30th minute. The Indian Colts were on the front foot and played with a positive mindset in the second half. They kept pushing hard but ended up conceding another goal with an excellent counter-attacking move by the hosts in the 82nd minute. This sealed the fate of the game. "We created so many chances and that is a very good sign going forward. It is just a matter of time we get our act together in front of goal. We have been working on various aspects of our game and the boys have been learning and delivering in training and games. The only thing missing is goals and I'm sure they will come in due time." 19 AFC Championship qualifications are slated to happen next year and the All India Football Federation is making all the efforts to organize as many exposure Tours and arrange International friendlies as possible in order to prepare the Indian Colts. You can also follow ALL the LIVE updates of the match on Sportskeeda. After a 2-0 drubbing against Serbia in the first match, do you think the Indian colts will win the upcoming match after learning from their mistakes? Do share your opinions in the comments section below.